There’s a number of good reasons why Vancouver, Canada, has become the second largest AR/VR hub in the world. Nestled between fir tree-covered mountains and sandy urban beaches, the city hosts more than 220 AR/VR companies that are pioneering the ways that we will live, work, and play. The showcase will first spotlight Vancouver’s augmented and virtual reality (AR/VR) ecosystem. 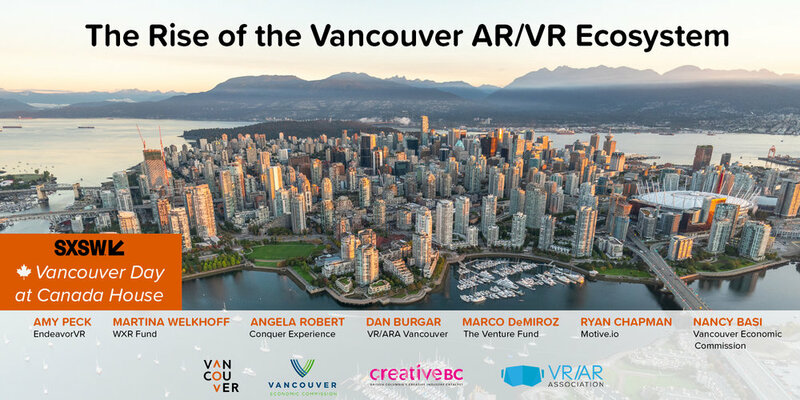 Keynote speeches from Amy Peck (founder/CEO of EndeavorVR) and Martina Welkhoff (founding partner of the Women in XR Fund) will precede a panel about the reasons why Vancouver has risen to become the second largest AR/VR hub globally. Representatives from companies including Conquer Experience, Motive.io, and the VR/AR Association will discuss B.C.’s dynamic innovations to international stakeholders, and the reasons why Vancouver is a top destination for tech investment, opportunity, and development.